How will you choose the colors that will become the palette for your wedding day? Will you focus on your own favorite color, take inspiration from the colors at your venue or start with an open canvas? Kristina Roy (nee Johnson) narrowed down her selections by connecting colors to different wedding styles. Her goal was to create a romantic, rustic elegance that would work well in her venue and reflect her own personal taste. The colors she chose, blush pink, burgundy and purple, were selected for a feeling or mood she associated with them. 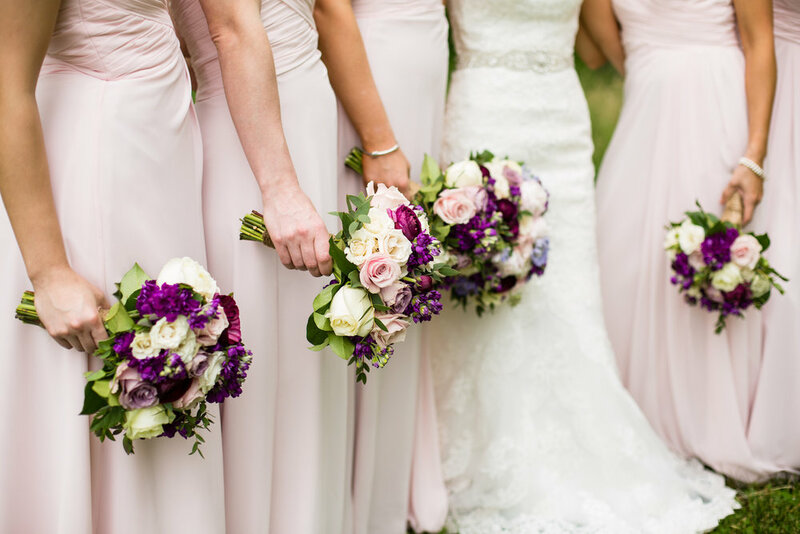 Blush pink felt more casual and rustic to Kristina, burgundy, more classical and the deep purple that she selected felt more elegant. In the end, each color served a purpose as she created the blend in styles she was looking for on her wedding day. Blush pink dresses pop in contrast with deeper hued florals. Pamela Lepold Photography. Bridal bouquet more structured with greenery. Pamela Lepold Photography. 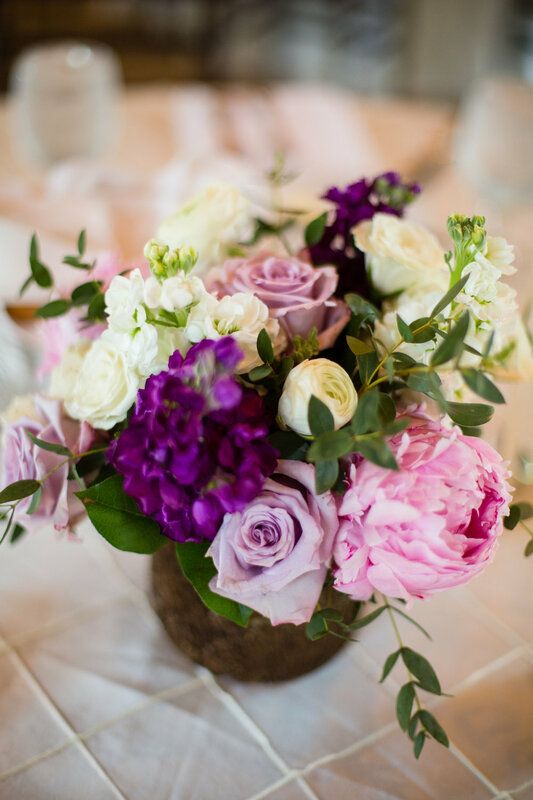 For a floral designer, the combination of two colors creates a contrast that allows individual flowers to be seen. Purple and burgundy are both combinations of cyan and magenta. They are warm but strong colors and really fun to work with. During their consultation, Jennifer asked Kristina whether she wanted to use the deeper hued colors throughout her entire decor. Color everywhere is a little more-grand, a little less romantic. 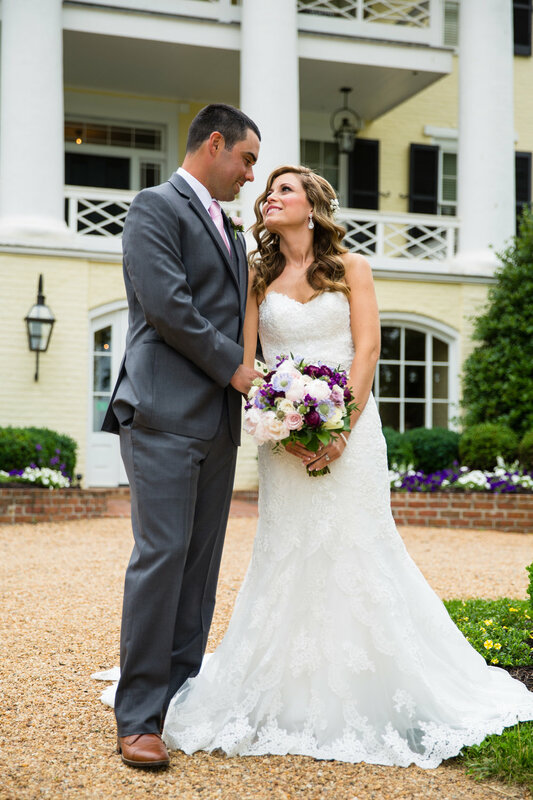 Kristina chose to limit the darker colors to the bridal party and the reception space, returning to softer blush and ivory for all of her ceremony décor. Purple Snapdragon and Burgundy Ranunculus with soft pink Peony. Pamela Lepold Photography. The bouquets were less formal than a tighter, compact ballroom style, but they had a lot of structure and were fairly organized compared to some of the loose, cascading bouquets that many brides carry. 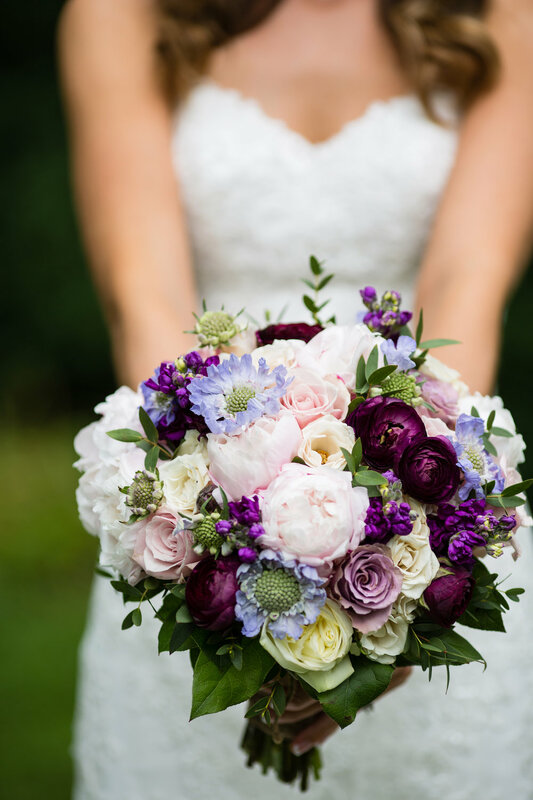 The color and style made the bouquets a little more elegant or formal, pairing well with dresses featuring a sweetheart neckline. “I really went back and forth about the style for my bouquet.” Kristina and Jennifer looked at a lot of photos together during her consult. She recalls that it was Jennifer who really helped her settle on a design. “She watched my expression as we looked at each of the photos and noticed that I reacted strongly to designs similar to my final bouquet. She read my cues.” Kristina really went with her heart despite the fact that the cascading bouquet had so much appeal to her. The Inn at Willow Grove is a boutique, luxury hotel in Orange, Virginia. “I picked the venue because it fit what I wanted to do with my wedding so well. It’s elegant and luxurious but it has so many rustic elements in the décor from the barn to the rafters, fireplace and lantern chandeliers. Gabrielle, the coordinator, is a pleasure to work with. She helped me with a lot of details.” Kristina also hired Gibson Rentals to drape and light the underside of the tent on the property adding romance and elegance. 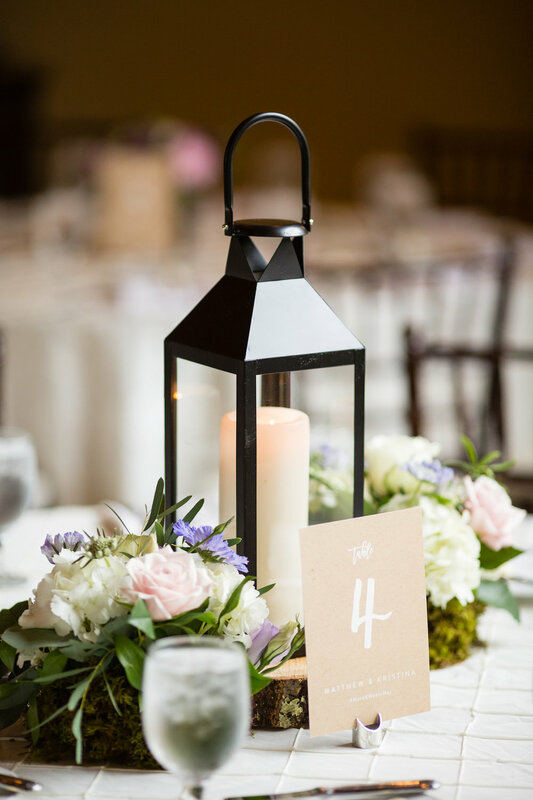 Kristina chose to use two different centerpiece designs, a lantern with floral bundles on a wood slab and a vase fashioned with darker bark. We used pink Peony in the centerpieces because they were available in a perfect shade. We also used lavender Roses, purple and white Snapdragons and white Ranunculus. 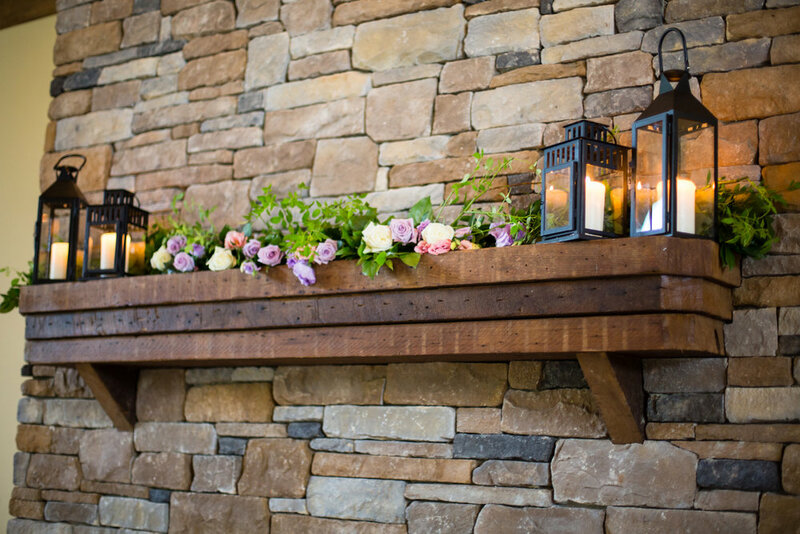 The fireplace was adorned with candles, greenery and flowers. Hair and Make-up by Ana B. Pamela Lepold Photography.